Al-Qaeda is intensifying its efforts to put operatives into the US and the nation is at a heightened risk of attack, a US intelligence report says. Analysts warn the terror group may make use of the skills and contacts of battle-hardened militants from al-Qaeda in Iraq to strike on American soil. Al-Qaeda's leaders have found a "safe haven" in Pakistani tribal areas which has allowed them to regroup, they add. Officials say there is no specific terror threat in the US at present. The release of the National Intelligence Estimate report follows leaks of a classified assessment last week. 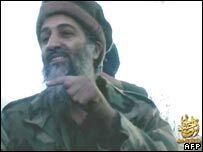 That report said al-Qaeda's operating capabilities were at their strongest level since the 11 September 2001 attacks, despite a six-year campaign to dismantle the network. Questioned by reporters last week, President George W Bush rejected the suggestion that al-Qaeda was back to its pre-9/11 strength, saying that was "simply not the case". Tuesday's declassified intelligence report warns that there will be a persistent risk to the US from terrorism over the next three years, concluding that the US is in a "heightened threat environment". "Although we have discovered only a handful of individuals in the United States with ties to al-Qaeda's senior leadership since 9/11, we judge that al-Qaeda will intensify its efforts to put operatives here," the report says. The group is determined to acquire nuclear, biological and chemical weapons and "would not hesitate to use them if it develops what it deems is sufficient capability", according to the report. Analysts assess that al-Qaeda "will probably seek to leverage the contacts and capabilities of al-Qaeda in Iraq, its most visible and capable affiliate and the only one known to have expressed a desire to attack the Homeland". This association with militants in Iraq has also helped al-Qaeda to energise the wider Sunni extremist community, raise resources and recruit operatives, the report says. However, increased efforts by US and international agencies mean militant groups view the US as a "harder target to strike" than at the time of the 9/11 attacks. Frances Townsend, homeland security adviser to Mr Bush, told reporters that al-Qaeda was weaker than it would have been had it not been for US efforts since 2002. Questioned on whether the war in Iraq had provided an ideal training ground for terrorists, Ms Townsend conceded that al-Qaeda might try to make use of its contacts in Iraq. But she said extremists were also gaining experience in other places, such as Pakistan and North Africa. Intelligence officials say the "safe haven" of Pakistan's tribal areas allows the group to protect and regenerate its attack capability by shielding its top leadership and operational commanders. 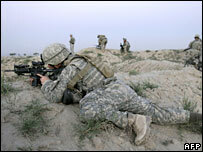 Ike Skelton, Democratic chairman of the House Armed Services Committee, said that with hindsight the US had erred when it turned its attention from Afghanistan and the hunt for Bin Laden to the Iraq war. The NIE report warns of the risk that international co-operation may wane as the memory of the 9/11 attacks fades. But Ms Townsend said the US was determined to work together with its allies around the world to combat the danger of extremism. She added that tracking down al-Qaeda leader Osama Bin Laden was still a "huge priority" for the US. Analysts see a danger that home-grown terrorists, connected by increasingly radical internet sites, may strike in the US. However, they say this threat is not as great as in Europe. Homeland security officials have urged Congress to pass a new surveillance bill that they say will allow them to monitor terror suspects in the face of huge advances in communications technology.